DC theater at its best. That’s what we had today as the much-anticipated photo-op meeting between US President Barack Obama and Israeli Prime Minister Benjamin Netanyahu took place. Both parties got what they wanted. Obama had a warm press conference with Bibi, sending the message that American-Israeli relations are as warm as ever and reassuring his Jewish Democratic base (which he is more worried about than he needs to be) that he still loves Israel. He got more statements from Netanyahu committing to a general concept of peace and a lot of praise from Bibi about Obama’s concern for Israel. Bibi got a good deal more. 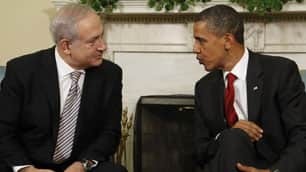 Not only was he able to show Israel that the relationship with America remains strong, but he got Obama to publicly imply that the US would continue to back Israeli nuclear ambiguity and to say that he would side with Netanyahu on moving to direct talks with the Palestinian Authority despite there being no indication that actions would be taken to make this politically feasible for Palestinian President Mahmoud Abbas. But in the end, it was just a show. Nothing much changed today, though perhaps Bibi’s closing words, urging Obama to visit Israel, set the stage for the next act. In the next few days we may find out, that something more important happened behind closed doors between the two. But one thing that was anticipated that seems not to have come about is Obama pressing Netanyahu for an extension of the settlement freeze. Check out Mitchell Plitnick and “Those We Can Talk To and Those We Cannot.” Exploring some new thinking in the American military and the important distinctions between Hezbollah, Hamas and al-Qaeda. I was reminiscing recently about a very pleasant conversation I had with Stephen Walt, who, along with John Mearsheimer, wrote the explosive book “The Israel Lobby.” Both authors are aware that I disagree with their thesis, and yet Stephen and I were always able to have respectful conversations about it. Would that more conversations about Israel could be conducted in that manner. But I also disagree with what I call the Chomsky Thesis. Chomsky, and some other analysts, believe that “The Lobby’s” power derives from its essential rapport with American policy aims, and that if it diverges from those aims, it would not prove much of an obstacle. “The Lobby’s” field of play is Congress. To the extent Congress can and will push back against a president on foreign policy, “The Lobby” will get it to do so when they disagree with that president’s policies. It has often been the case that “The Lobby” tries to push the US into a harder line than Israel takes. It has done so again this week. The Senate, almost as a body, has written to the President in full support of Israel’s version of the events aboard the Gaza-bound flotilla over Memorial Day Weekend. It re-states the position that the siege on Gaza is legal and was imposed to stop the import of weapons to Hamas, while ignoring the question of how children’s toys, coriander, mayonnaise and ketchup could be classified as weapons. It also asks the President to consider putting the IHH, the Turkish organization which is most certainly supportive of Hamas, on the list of terrorist organizations. Few events are as badly misunderstood as the 2006 election that brought a stunning victory for Hamas. Fatah completely from Gaza and taking unilateral control. I bring this up because a friend asked me how Hamas might be undermined today. The answer is both pragmatic and involves no devious tricks or the use of force. The first step is easing the Gaza siege so that the people can rebuild destroyed homes and business, and resuscitate their economy. Already, even Israel has conceded this can be done without compromising security measures. And that it can be done while largely bypassing Hamas.